Winter in the Pacific Northwest generally means rain. And lots of it. Once it starts, most plants turn to mush, except the little succulents in my rock garden. It's nice to have something to look at and admire in the winter. 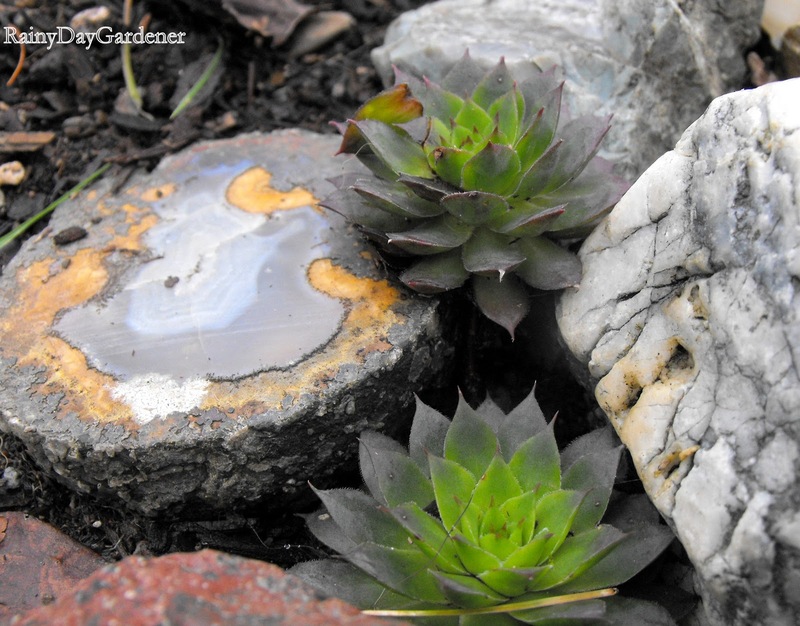 As I'm married to a geologist of sorts, we have acquired a pretty rock collection around which I've planted my succulents. I hope to improve upon my rather slim succulent collection (I have only one variety) as I'm reminded of what a nice feature they are during this dreary time of year. Anyone have succulent suggestions that are versatile enough to brave both the rain and the sun? They look pretty good! I brought my other succulents inside, but they don't look good! There is no enough light and the air in the house is dry! How nice to see some green in the winter time! I have some sedum that is actually poking through despite the winter. I don't know if that might do well in your area? It's one of the creeping variety, and I have it planted in a pair of old work boots. I love hens and chicks, they are one of my favorites. Yours looks so good against the rocks. I have a few other trailing kinds of sedums. Besides the typical Autumn Joy, I also have the native Sedum spathulifolium, Sedum sieboldii, spurium 'Tricolor' and 'Dragon's Blood.' All just wonderful, and doing well in a slightly raised bed with good drainage and a western exposure. I want more too. I was just noticing how good the sedums are looking now. 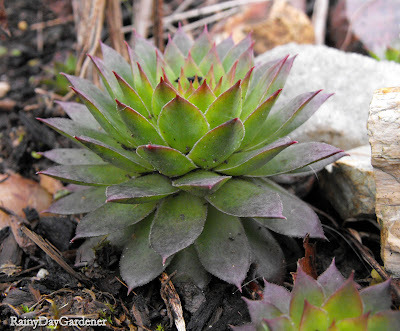 I love hens and chicks and have found several varieties. I have several succulents, but have lost track of which is which, most are planted in groupings in containers. I love how easy it is to make new plants just by breaking off a piece and sticking on the soil. I will have to dig my can full of tags out of the snow and find out what I have. I found an old log and put succulents in the holes. It looks great when the deer and mice don't eat them in the winter. I know there is a low growing sedum. 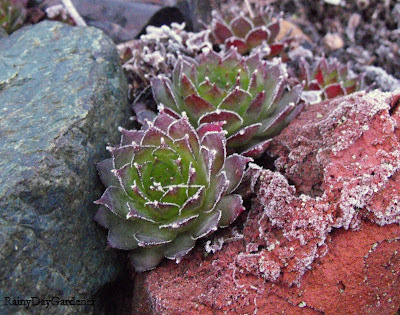 I think your hens and chicks look great amoung the rocks. Your rocks with the succulent plants look really nice. I wouldn't have thought those plants were hardy! Great to see.